My Pleinair “Earlybird” Mug arrived today! I got it at RosenQueen for 9.99! They are having their 2nd Anniversary Sale. Pretty sweet deal! Pleinair ( ???? ?, Puren?ru) is a fictional character who has made appearances in several games in Nippon Ichi‘s tactical role-playing game series. She is something of a mascot character for the artist and character designer of these games, Takehito Harada. The name “Pleinair” is two French words put together; “plein” meaning “full,” and “air” as in English. Together, the phrase means “outdoor”. Due to her appearances in video games being little more than cameos, not much is known of Pleinair outside of her physical appearance. 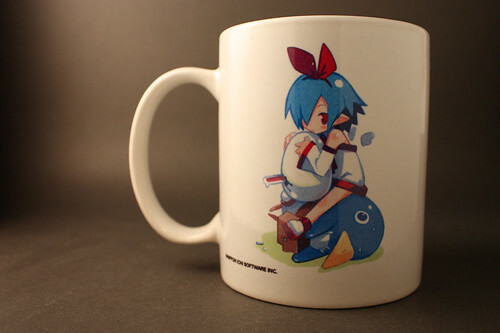 She is typically portrayed as a petite, blue-haired girl with red eyes, wearing a red ribbon, a white dress, white stockings, and sometimes glasses. She is often accompanied by a stuffed rabbit named “Usagi-san” and a stuffed shark named “Same-san.” A common motif in images of Pleinair is Usagi-san being eaten (or at least gnawed or bitten) by either Pleinair or Same-san. She appears as the receptionist in Disgaea, and is a playable character in the DS version (if you beat the game). She’s also part of a news crew in Disgaea 2, and as a class rep in Disgaea 3. @ mike: Thanks for visiting! I hope you enjoy my site! Will definitely be adding more content in the future!